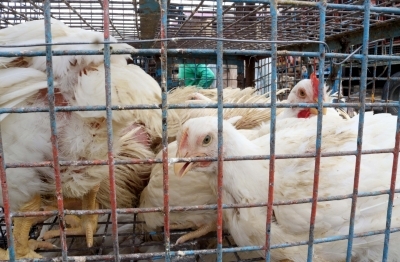 Hyderabad, Nov 20 (IANS) The Hyderabad High Court on Tuesday issued notice to the governments of Andhra Pradesh and Telangana and major poultry industry players over illegal killing of unwanted chickens. The order came following a Public Interest Litigation (PIL) filed by People for the Ethical Treatment of Animals (PETA) India, seeking the court's direction to stop the poultry industry from using various methods of killing male and other unwanted chickens. "Chickens used for meat are bred to have fleshier upper bodies, and those used for eggs are bred to produce an unnatural number of eggs," PETA said in a statement. Hence, PETA said, the egg industry considers most male chicks useless because they cannot produce eggs and are not the type used for meat. The animal rights organisation filed the petition following an eyewitness expose of several hatcheries and farms in Andhra Pradesh and Telangana which revealed that millions of male and other unwanted chickens are commonly ground up, drowned, burned, suffocated, crushed and even fed to other animals by major Indian egg and meat suppliers. "Consumers have a right to know that male chicks are killed by the egg industry and that this is done by methods such as grinding them up, crushing, suffocating, or drowning them," says PETA India Associate Director of Policy Nikunj Sharma.